Nothing Works Forever: Perpetuating the Mission & Values of the Organization! “Nothing works forever. Our purposes never change – but our methods and tactics must constantly change. It is amazing how quickly a successful organization can deteriorate into mediocrity.” ~ Rick Warren, Pastor and Founder of Saddleback Church in Lake Forest, California. This week’s lesson in Maciariello’s (2014) A Year With Peter Drucker was based on an interview with one of my hero’s – Rick Warren. Dr. Warren founded Saddleback Church in Lake Forest, Calif., in 1980 with one family. Today, it is an evangelical congregation averaging 30,000 weekly attendees. 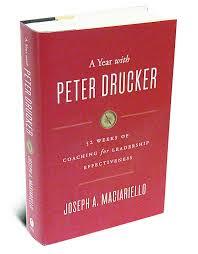 Peter Drucker and Dr. Warren were friends and this week’s lesson was based on a 2003 interview. They discussed that organization must innovate and change. Organizations also tend to become bureaucratic and need to have conscience activities for maintaining and transmitting its core values (Maciariello, 2014). These principles should be implemented in a way that will perpetuate the mission and values of an organization and provide continuity, while also facilitating change. The key here is facilitating needed innovative change, but at the same time having continuity. Tough order, huh? Drucker posited that we all need people committed to our vision our our teams, but we also sometimes need radical change (Maciariello, 2014). Drucker also argued that change and continuity are not opposites, but a continuum (Maciariello, 2014). If an organization does not change, it will die of being status-quot. In order to achieve continuity, therefore, an organization must be designed to change. Change and continuity are thus poles rather than opposites. Interestingly, I just spoke on this last week at the American Federation for Children National Education Policy Summit. In our panel I stated that in education and “school choice” that we were in danger of the new beginning to look like the old. In other words as a believer in “school choice,” we must make sure that the choices are not just some of the same old thing in a new wrapper. We must create schools that have the core value of all students can learn, but are differentiators in the way we do that. We need schools that educate better than anyone else and that have an “edge” or “niche” in doing so. In other words, a constant stream of incremental improvements will lead to substantial change and great schools over time. Schools, and all organizations, should therefore seek and reward continuous improvement activities. Continuous improvement must be one of our “BIG” initiatives to be working on in education, and all organizations for that matter. According to Maciariello (2014) change can occur in two forms: 1.) creating new wealth through innovation; 2.) creating wealth by moving resources from low to high productivity. Competition speeds this process up. This is why I am such a believer in school choice. We cannot predict the future, so it is our job, as leaders, to have the core values in place to allow for changes in products, processes, and services that will continue to meet the needs of our customers in the future. As an “Energetic Change Agent,” I know that change is risky and creating the future is a lofty goal, but it is much more risky to leave the future to chance. Are your organization’s core values strong enough and believed by all to make it possible plan for change? Are your own core values and change agent abilities such that you will be able to maintain organizational cohesiveness during necessary changes? Isn’t it excited to be creating the new future?